Medical Counselling Committee (MCC) has started the counselling of NEET 2018 from 13 June. 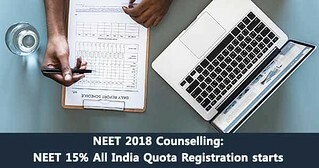 Aspirants who were included in 15% All India Quota scheme can appear for NEET 2018 counselling. In order to participate for NEET counselling, aspirants are required to register themselves using the link provided on this page. During registration of NEET 2018 counselling, aspirants must enter their NEET, personal and contact details with the provided security pin. Only after the registration process, aspirants are allowed to fill their preferences of colleges as well as courses for NEET UG counselling, which will begin from 18 to 19 June. NEET counselling Round 1 result will be announced on 22 June 2018. Note: As per the data of MCC, a total of 4393 seats will be filled in 15% AIQ and 9204 seats will be filled for Deemed Universities. The important dates of NEET counselling can be checked below in order to avoid missing any other events. How to register for NEET Counselling 2018? After verifying the details, submit the NEET counselling registration form. A preview page of the information will be displayed on the screen. The registration slip will display on the screen. Take a printout of application form for future references. Along with that, option to login for NEET 2018 counselling will be provided on this page.